I am excited to be participating in Beth's Let's Get Acquainted Bloghop because I love reading blogs and this is a great way to find some hidden gems out there. My aesthetic is fairly modern, though one of the great things about quilting is that you can really do whatever you want. Sometimes I like to follow patterns and sometimes I like to do my own thing, but I always love working with fabric and I love to make things. I am a 29 year old mom of two wonderful kids. For the past 7 years I have lived in West Los Angeles, but before that I lived in Utah for several years and I actually grew up in a very rural community in Texas. I am a bit schizophrenic when it comes to interests and I actually got my Bachelor's degree in biology while minoring in math and English. During my time in college I worked as a lab assistant an editor, and a calculus TA. One of the wonderful things about quilting is that it uses both my analytical and creative sides. How did you start quilting? When I was pregnant with my son 3 years ago I felt a real need for a hobby. My husband is an attorney and tends to have long work hours and I was staying at home with my daughter. I convinced my husband that I needed a sewing machine and just figured it out. Thank goodness for all of the wonderful resources on the internet; there were some bumpy moments (understatement!) but quilting has turned into a very rewarding hobby. I have a wonderful Janome MC6600p which I bought a little over a year ago. It sews like a dream and I don't know what I would do without it! When I started sewing I found blogs to be invaluable. There was so much information out there and I loved being able to read about all aspects of the quilting process. I wanted to become part of that quilting world and I have really loved sharing my projects. Sewing the final seam of a quilt top. I guess this is only true of a larger quilt since smaller quilts are easier to handle, but I always find this step awkward. Sewing the binding onto the quilt. I am not talking about hand sewing it onto the back (I love that part!) but I don't like actually machine sewing the binding onto the front of the quilt. Squaring up the quilt after quilting. I know that some people skip this, but I do think it is important. I just don't like doing it. I am on Flickr, Pinterest, and my Instagram username is ericajackman. Thanks for stopping by! If you would like to see more of my projects . . . If you are you interested in following my blog, you can find me on Bloglovin'. Such gorgeous makes and I love that picture of your girl with the quilt wrapped round her - so sweet! It's funny how folk enjoy different bits off the process! I like the machine bit of binding but am really impatient about the hand sewing. There should be a club for passing the jobs about! Love your work and great blog hop post! love your quilts. any tips on squaring up, also not a favorite of mine! 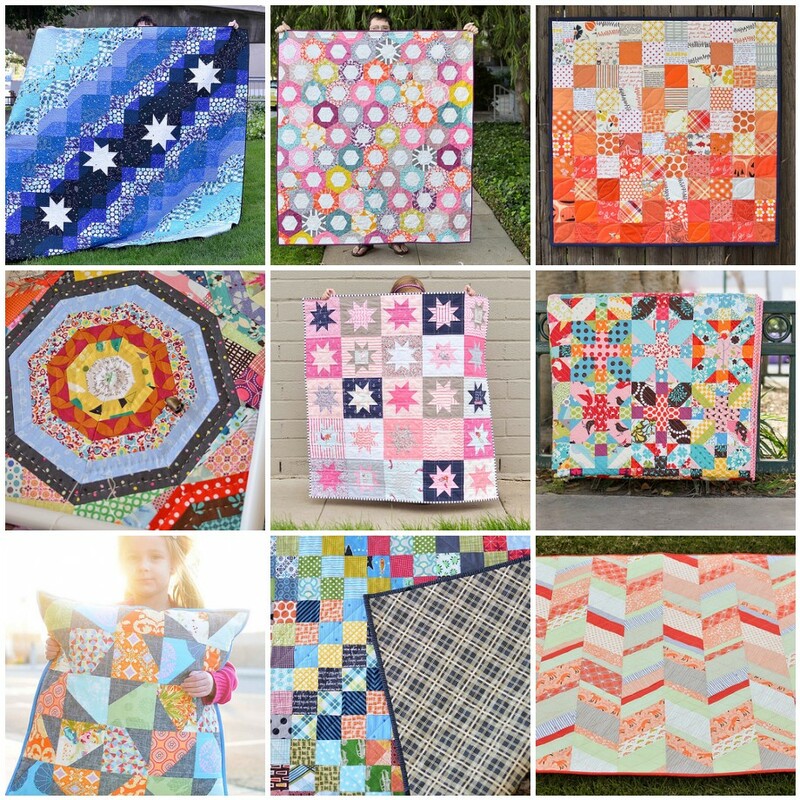 I seriously just love every single one of your quilts - gorgeous!!! And I totally agree about that final seam of a big quilt! Thanks for joining in. Nice to learn a bit more about you Erica, and of course love seeing your beautiful projects again. Great post Erica! I'm already a follower as well! Good to see another SoCal girl out there in the quilting blogisphere! Wow, your quilts are stunning - and made with some of my favorite fabrics. I really like your aesthetic. I also love hand stitching the binding down. I love seeing the quilt become "finished" just like that. Erica, it was wonderful to learn more about you. All your quilts and other projects are beautiful. Fun to get to know the person behind the blog! Love your work and your star blocks are perfect! I hate squaring up the quilt too. I do everything possible to keep it square as I go, but in the end I am a little lost at what to whack without messing it up! It's fun to know more about you! I started quilting when pregnant with my son, about 4 years ago. I used my mom's 15+ year old Janome and just dove it. A couple years later I needed bigger and better, so I got the Janome 6300, and have been LOVEing it. Love your quilting style! Good post! I already love following your blog and those project pics you posted are lovely. I just got a half yard bundle of Constellations in the mail today because I was so inspired by your quilt! You really did a great job on your post! I love your collage of some of the projects you made. They turned out really really cute! Great post! Glad to meet you through this blog hop. I'm also in the Lucky Stars BOM, and having a blast. Your projects are just beautiful and I look forward to seeing more from your blog in the future! Wow! So many beautiful quilts and pillows!! I love the one with the triangles. You have a great looking blog that's easy to read with great photos. I started following your blog a few weeks back before Beth announced the blog hop. I love your quilts. 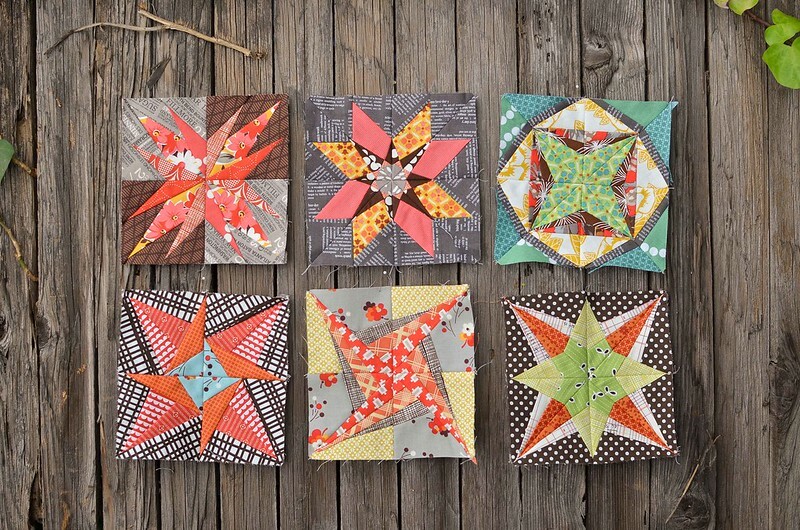 I am also participating in the lucky star quilt along and must say your blocks look great. Hi Erica, so nice to meet you! Great quilts and post. Glad you decided making quilts would be your hobby! Ooh, you're doing Lucky Stars. I am SO behind on that BOM. I do have the foundations printed out, and I kind of know what fabric I want to use, so I guess that's something. Nice to meet you! This blog hop has been loads of fun so far. your quilts have really stunning design and color choices. I understand the desire to find joy in all aspects of quilting. For me, basting is a real pain. :) I'm a new follower, nice to meet you! 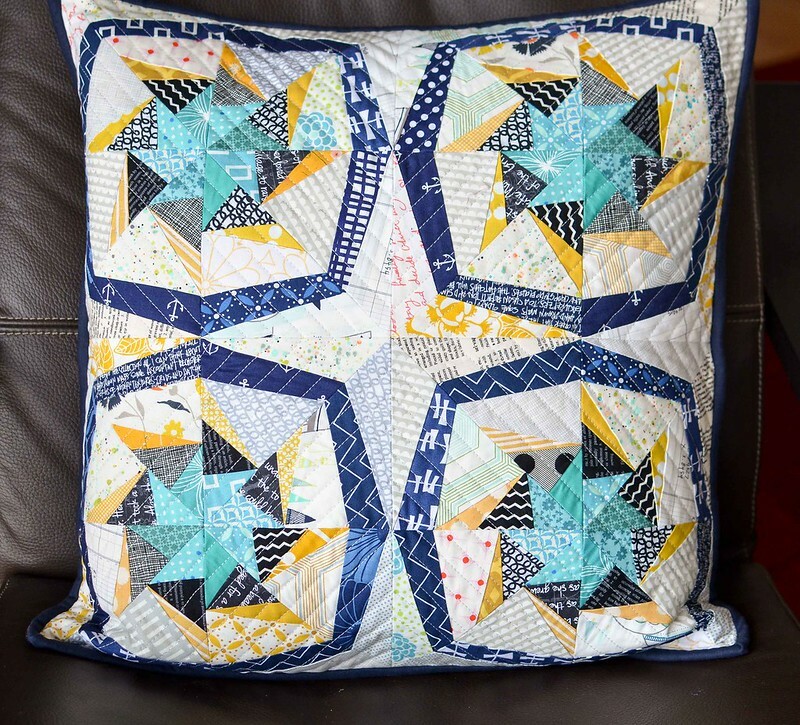 Your Constellations Quilt is to die for! I really love how you laid out the fabrics. That's definitely one of my favourite fabric lines right now and you've done an incredible thing with it! Thanks for sharing your tutorial. It was great getting an intro to you on the blog hop! I love your wonky circles quilt and the beautiful blue stars in your constellation quilt. Kitchen Table Quilting is a great name for a blog! Hi Erica, this blog hop is great to introduce us to new bloggers. I love your Improv Circles quilt and read in the blog post that you used Kaffe shot cottons for it- how did you find sewing with them? I've heard some say that they are not as crisp as some other shot cottoms, and therefore not as easy to sew with. Hey Erica - you already know I follow your blog. It was nice to get to know you a little better through this post though :-) I think you have a fantastic eye for colour and design! Thanks for sharing. I really enjoyed reading it and looking at all the eye candy. Your selection of quilts is amazing. Hi Erica, nice to meet you though the blog hop. Seriously gorgeous quilts, I am now following you. Lovely to meet you! Love the photos. I've been a follower and love everything that you do and we have very similar style. I hate square up stuff too and when you're not following a pattern and sort of improvising as you go it turns into a real headache. Thanks for sharing. Hey Erica! You have some very lovely makes! Have you been to Sew Modern in LA? I am wondering if I should make the 2 hour drive and visit that shop! I agree. That last seam on larger quilts in a pain in the neck! LOL! This Blog Hop is really helping me discover the "people" who go with some really lovely quilts I've seen on Pinterest and Flickr! I've seen your Bangles quilt before (maybe Jeni Baker has pinned it?). I have my eye on that pattern too, and have even done a fabric pull. Yours encourages me that it CAN be done! Hi Erica, your quilts are fantastic! Your blog was one of the first I followed as I love your style. Definitely agree with you on the dislikes, as a new quilter they're things I struggle with and can't see that changing much! Already a follower way before this hop.. I fell in love with the quilt on your header..the solid curves... Great blog you have here. Thanks for sharing your journey of blogging and sewing adventures..Good luck and have fun blogging! I am loving all your stars!! Beautiful! I have enjoyed discovering you as part of the blog hop. Your projects are great and I look forward to seeing more in the future! 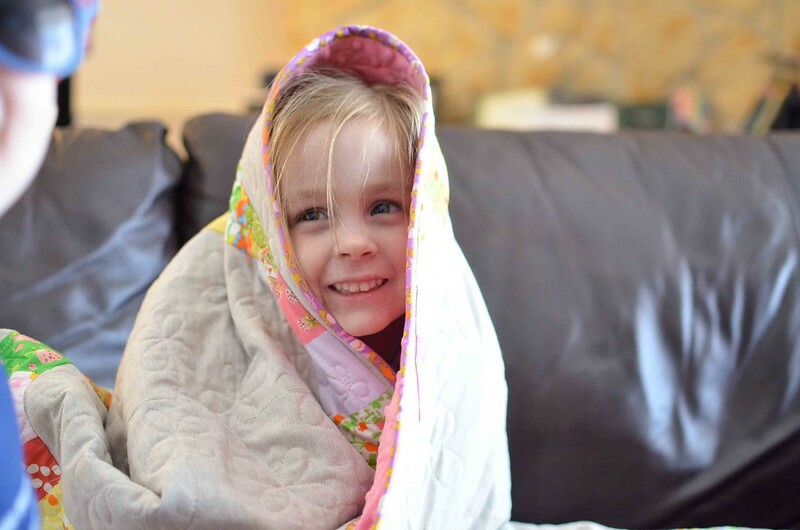 Erica, your projects and fabric choices are stunning! I'll definitely be back to visit again! Pleasure to meet you via LGA! As many have said above your color and aesthetic are beautiful. I can't wait to read your back catalogue, as you seem to have a lot of tricks up your sleeve! I totally quilt at my kitchen table too, much to the chagrin of Mr. Sparkles! Some lovely projects there! I do have a work-in-progress sewing space, but mostly end up at the kitchen table: it's nice and big and I don't feel isolated!!!! Beautiful work! I recognize those gorgeous paper-pieced stars from the Flickr group. Do you go to the LAMQG meetings? I don't know if I've seen you there. You have a great aesthetic on your blog, great colour sense for those quilts too. I particularly like your improv circles quilt! And I've decided to follow! First, I LOVE your improv hearts quilt--I remember when it was first posted on the Moda Bake Shop and I thought it was a brilliant idea. You other quilts are beautiful, too! I hate squaring up before binding, too. Sometimes I always end up making things uneven. Can't wait to see what you write and design in the future! I've been 'stalking' your blog for a while now, good to see you as part of the hop! I love your quilting style! Very clean and you have great taste in fabrics! Ugh-squaring up! I hate that part and if anyone saw how I did mine, I would be ticketed by the quilt police indefinetely! Erica, Your quilts are lovely. Your blog is bright and friendly and your pics are very cute. Nice to meet you on the New Blogger Hop. I just pinned your stacked squares quilt the other day when I saw it pop up on the Moda Bake Shop, it's such a great idea. Up until yesterday I was also a kitchen table quilter but there's now a perfect sewing machine sized hole & support shelf in what was the 2 person computer desk, we're now looking for a new 1 person computer desk so I can sew and he can do his thing and we can spend time together in the same room (: Think ill still be cutting on the kitchen table for a litte while longer though! I enjoy your blog - love your color choices! Can't wait to see what you make with all the blocks. I really love your fabric choices, and the patterns you paired them with! Working with the fabric is my favorite part of quilting, it gives me a reason to use all the color and design with a very practical purpose. I did mostly garment sewing (if I sewed), and it felt very restricted because I would see a fabric and love it, but not know what clothing to make with it. Quilting feels so free and open comparatively! Those are attractive blocks on the fence. Perfect setting for them. I really enjoyed getting to know you a little more through this post. And love the pics with your kids in your banner. Sweet shots! What an amazing set of finishes. Nice collection, so much hard work!!! Ooh, I just love your style Erica! I'm really enjoying looking back at your quilts. I love your bright color aesthetic. I can definitely relate to enjoying how quilting combines the creative and analytical sides. New follower and looking forward to more! So nice to meet you! I love your blog name! Your blog header is particularly nice! I love your quilts. You are very talented and have really produced many, professional quilts. Thank you for making beautiful things! Hi There, you have some wonderful projects! And it's so lovely that your daughter is getting involved in the creative process too :-) My daughter is 4 next month so I am hoping it won't be long before she can join in the sewing fun! Erica, please forgive my tardiness in my visit! I love what you are doing here-that quilt with the white hexagon centers is fantastic! I like what you said about this being an expensive and time consuming hobby and finding joy in all the parts - so true. I need to find the joy in the basting part! Hello! Can't believe we've made it to the last week of the hop. I'm going back to leave comments where I missed them the first time 'round. This summer has been insanity for us, and this first week was the week we were moving. I was doing nothing but packing! I just saw the updates to the blocks you posted here. They look awesome!